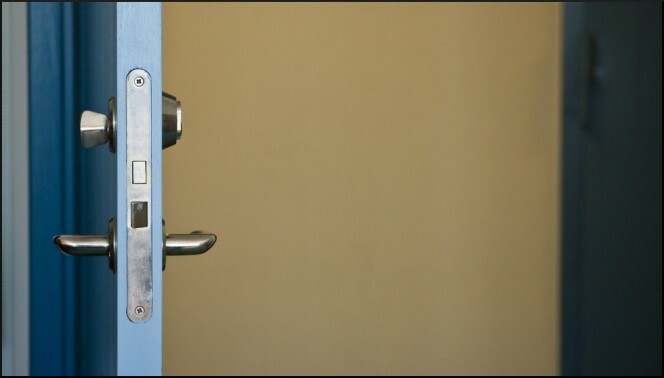 Lock picking and key bumping – what are they? Unfortunately, the issue of “thefts and robberies” is always very current and widely debated. 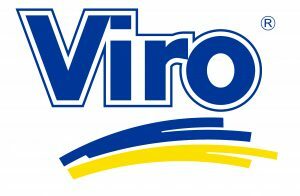 We recently presented Viro Palladium, the high security cylinder, which is capable of withstanding not only brute force attacks, but also breaking in by using more subtle techniques. Let’s see in detail what these techniques, called lock picking and key bumping, consist of; they are not exactly new, but are still fairly unknown to the general public, even though they are quite commonly used by thieves, especially professional ones. Lock picking consists in manually aligning the pins inside the cylinder, as would be the case when inserting the key, using the so-called lock pick whilst the plug is kept in rotation by using the so-called “tensor”. When the alignment has been completed it is possible to rotate the plug and open the lock. 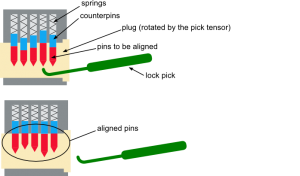 If, instead of pins, the lock is of the double bit type, there is a tool, called rather inappropriately the “Bulgarian pick” or more correctly the “soft key” which allows the key profile for a double bit lock to be reconstructed without having the original key and without removing the lock. The greater the number of pins the harder it is to align them all correctly with the lock pick. The number of pins of a cylinder is crucial to decrease the chances of success of lock picking. The greater the number of pins the harder it is to open the cylinder by lock picking, since the pins must be aligned perfectly one at a time in order for the lock to be opened. Also, the shape of the counterpins can be designed in order to withstand the action of the pick. Viro padlocks and cylinders, which are made in Italy, use, for example, “mushroom” type pins (with the head and base larger than the cylindrical body) which, under the action of the pick, tend to get stuck between the body and plug of the cylinder, thus making lock picking particularly difficult. The top row shows the pins, the middle row shows the traditional cylindrical profile counterpins and the bottom row shows various counterpins with anti-picking profiles. Rather than aligning the pistons one by one, as in lock picking, the key bumping technique tries to move back all the counterpins simultaneously in order to free up for a fraction of a second the rotation of the cylinder plug. A “special” key, the so-called Bump-key, is used for this technique, modified specifically for the type of lock to be opened, starting from a specific key blank. The “Bump key” is inserted in the cylinder, turned as far as possible, and then hit with a lightweight hammer, so that the teeth (or recesses) of the key transfer the impact force on to the pins, which in turn transfer the movement to the counterpins, and as a result overcome the tension of the springs and jump backwards. When the counterpins are positioned at a certain point beyond the opening line, it is possible to turn the key and open the lock by a throw. The procedure is repeated for the other throws. If, unfortunately, you suffer a theft committed by thieves skilled in the use of these techniques it would also be difficult to prove, for example to an insurance company, that you had been a victim, as these methods do not leave obvious signs of burglary. 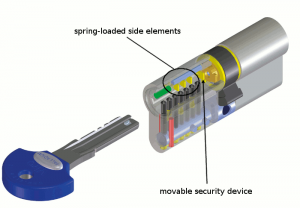 The new high security Viro Palladium cylinder has several moving parts arranged on planes different to those of the pins, making lock picking particularly difficult. Even though they may seem like “child’s play”, these techniques require a certain degree of skill and lots of practice, and for this reason it is almost only “professional thieves” who use them. However, it is still possible to resist them by means of appropriate action. Lock picking, for example, exploits small inaccuracies and machining tolerances in the cylinders to “find” the correct position of the pins and align them. It is therefore advisable to always choose good quality products, from trusted brands, which guarantee precise machining. 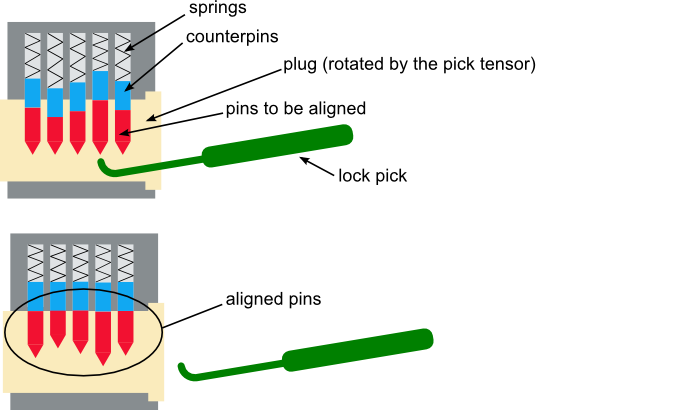 Also, having pins arranged on different planes, such as in the Viro cylindrical padlock or in the Viro Palladium cylinders, not only deals effectively with key bumping, but also makes lock picking more difficult, as it multiplies the number of items to be aligned and makes it particularly difficult to align the pins on one plane whilst aligning those on the other planes. As regards the opening techniques using the “Bulgarian pick” on double bit locks, it would be advisable to transform the lock to a new type, which specifies well the protection devices provided, or change the type of lock, favouring the locks prepared for European cylinders, which must, however, still be chosen on the basis of the security features. This entry was posted in Locks and Cylinders and tagged home, products, technology, tips on 30 March 2016 by calessandrini.